Gay Men Speak Of Brutal Treatment In Chechnya : Parallels Two gay men tell NPR they were kidnapped, beaten and interrogated in Chechnya before they were able to find refuge in Moscow. Human Rights Watch warns that Chechnya is conducting an "anti-gay purge." Two gay men, who do not want to be identified for safety reasons, left Chechnya after being kidnapped and beaten there. Gregory (left) says he was held for 12 days in a basement. Arnie (right) says he was disowned by his relatives after he was delivered back to his family unconscious, in a burlap bag. They spoke with NPR at a safe house in Moscow. At an unmarked apartment building in Moscow, there's a notice taped to a large metal door with a list of tenants who haven't paid their rent. Up five flights of stairs, on the top floor, two young men sit side by side on an old couch in a one-bedroom apartment. They're calling themselves Gregory and Arnie. They don't want to use their real names because they fear for their lives. 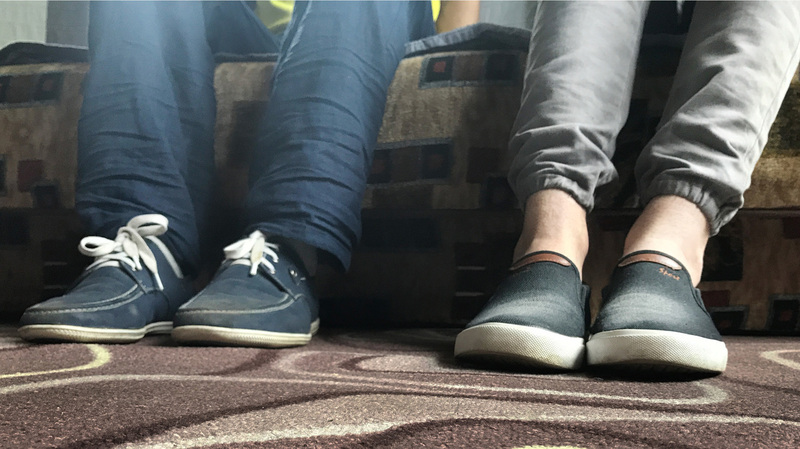 Both men recently left Chechnya, where they were detained and beaten because they're gay. "I was kidnapped and kept for 12 days in a basement," Gregory, 21, tells us through an interpreter. "I was beaten and interrogated." Stories like this started to surface in April, when the independent Russian newspaper Novaya Gazeta reported that more than 100 men had been rounded up and detained by Chechen authorities because of their "untraditional sexual orientation — or suspicions of such." The paper reported there had been three deaths. Human Rights Watch conducted its own investigation and confirmed what it calls an "anti-gay purge" by Chechen authorities. Russian President Vladimir Putin has ordered an investigation into the claims. Chechnya, a small, southwestern republic of Russia, is conservative and predominantly Muslim. "Homosexuality is generally viewed as severely tainting family honor," the Human Rights Watch report says. 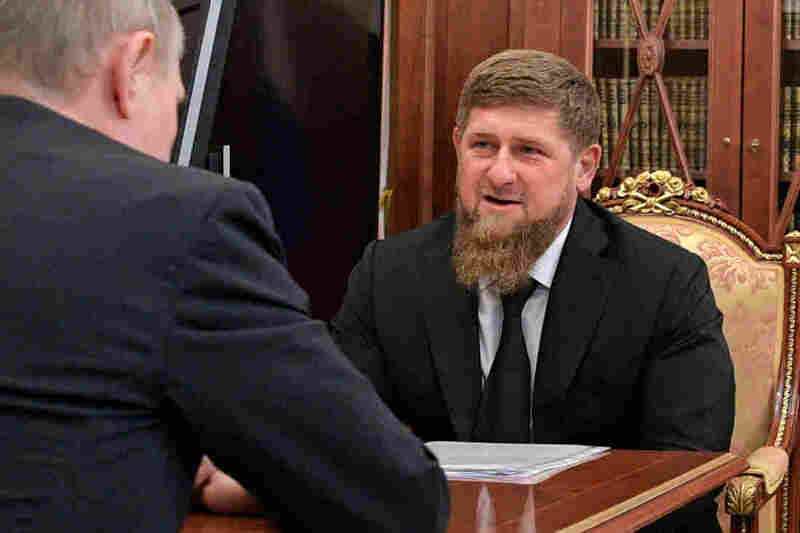 Chechnya's leader Ramzan Kadyrov met with Russian President Vladimir Putin at the Kremlin in April and denied reports that gay men were being targeted or mistreated. Chechen leader Ramzan Kadyrov denies claims of an anti-gay campaign. He told the Interfax news agency last month that gay people don't exist in Chechnya: "In Chechen society, there is no such thing as nontraditional orientation," he said. "Our people have for millennia lived by different rules prescribed by God Almighty and dictated by the moral and ethical norms of inter-personal relations." But Gregory and Arnie tell a different story. "When I was detained, the police went through my phone and social media," Gregory says. "They forced me to contact someone I was dating." He complied, and set up a date. Then he was driven by authorities to the place where the date had been planned. "They put a black plastic bag over my head and put a gun to my head," Gregory says. "They made me call the other guy and tell him to come the car. Then they kidnapped him as well." This is one way the kidnappings in Chechnya have multiplied, Gregory says. Detained men have been forced to name partners. "They told me I wasn't a human being and deserved to be murdered," Gregory says. Eventually Gregory was released. He says he's not sure why, but thinks it may be because he is not originally from Chechnya but elsewhere in Russia. The police gave him a bus ticket and told him to leave Chechnya. He contacted the St. Petersburg-based Russian LGBT Network, which operates a 24-hour hotline, and they arranged for him to go to Moscow. That's how he ended up in this safe house, run by the Moscow Community Center. The organization, which serves the LGBT community, says it has evacuated more than 30 men from Chechnya. Most of those who escape may never be able to return, activists say. That's the case for 18-year-old Arnie. As Gregory is talking, Arnie stares straight ahead, hands clenched in his lap. He asks for a smoke break and steps out onto the balcony off the living room. When he comes back, Arnie struggles to remember details of what happened to him in April. He's pieced together that he was kidnapped and severely injured, and spent nearly two weeks in a coma. "I don't remember anything," Arnie says. "I can only tell you what my cousin told me." Based on his cousin's re-telling, Arnie went missing and then he was delivered to his family's doorstep — unconscious, inside a burlap bag. "Some guys came to the house and told my relatives, 'This is your son, he is a homosexual,'" Arnie says. His uncle grabbed him by the neck, ready to strangle him. The only reason he stopped was because Arnie was already on the verge of death. Weeks later, when Arnie woke up in the hospital, family members came into his room and told him they were disowning him. Arnie thinks that is because of their Muslim faith. Human Rights Watch has reported that families in Chechnya, ashamed to learn their sons are gay, have been "indirectly encourag[ed]" to kill them to restore the family's honor. Arnie says he feels safe for the moment because it's the Muslim holy month of Ramadan. Once it ends, he's afraid his uncle will hunt him down and kill him.